Fourth Row Center: Film Writings by Jason Bailey: #TribecaFest Review: "Cinema Komunisto"
Mila Turajlic’s Cinema Komunisto is, as its opening titles explain, “a history of a country that no longer exists… except in movies.” As you may recall, there once was this country called Socialist Federal Republic of Yugoslavia, which existed until 1991, when it disintegrated into its individual parts—Slovenia, Serbia, Croatia, etc. 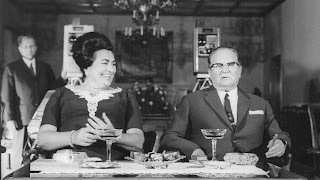 What you may well not have known was that the man who ruled Yugoslavia, president Josip Broz Tito, was a bit of a movie nut. The Communist Party had always seen film as a powerful propaganda tool, but there was more to it than that for Tito, who supported the country’s film industry to such a degree that the state footed the bill for a central film studio—the so-called “film city.” Within that city, Yugoslavia created its cinema. There is such pleasure to be derived from documentaries like this one—to discover this rich history, this whole world of films we’ve never heard of. And the political story is odd and fascinating; we are shown viewing logs to prove that, yes, Tito watched a movie every night (the President as film geek), and that he was “deeply involved in the filmmaking,” writing margin notes in screenplays and advising on casting (the President as studio head). And he extended the full resources of his office to the state’s filmmakers—we see, for example, newsreel footage of real soldiers working as extras (“I’m doing my military duty,” says one). By the early 1960s, Yugoslavia had become a respected member of the world cinema community (Hitchcock, Orson Welles, Kirk Douglas, and Sophia Loren visited); the 1969 epic Battle of Neretva, shot over 16 months with an international cast, was nominated for an Oscar for Best Foreign Film, and when the time came to make a biopic of President Tito, he hand-picked Richard Burton to play the lead. But Tito’s sudden death in 1980 cooled the industry, and the break-up of the republic in ’91 finished the job; Avala Film, the primary filmmaking entity, is still around, and the props and costumes are still in stacks and on racks, but the electricity has been shut off in the film lab. Turajlic gathers technicians, actors, and directors to piece the story together. The primary face of the narrative, though, is Leka Konstantinovic, President Tito’s in-house projectionist for 32 years; still loyal and reverential, he is a charming protagonist. Editor Aleksandra Milovanovic cuts the picture well, sharply intercutting the country’s postwar history and how it was portrayed in their films, and getting a few showcase montages (like a tight sequence of none-too-subtle partisan messaging). The only trouble with those montages is that the film uses no identifying titles on the clips; we don’t have a sense of how many different films are being pulled from, how far apart they were, or when the same ones are reappearing. And it must be noted that Turajlic waits until awfully late in the film to voice any criticisms of the Tito administration; there appear to be legitimate ones to be made, but they’re done so briefly, their presence in the picture is almost an afterthought. It feels, all in all, like it may be a bit of a puff piece. The pacing is occasionally off as well; it wanders a bit in the second act, with detours that don’t fall into place as easily as the earlier material. But what Cinema Komunisto contributes to the world film narrative is valuable, and the picture has a jazzy, crisp style—it’s fun to watch, and tells an entertaining and informative story that should pique the interest of history buffs and cinephiles alike. "Cinema Komunisto" screens in the Tribeca Film Festival on Saturday 4/23, Monday 4/25, and Wednesday 4/27.